A 49 qubit chip? Talk about quantum supremacy. 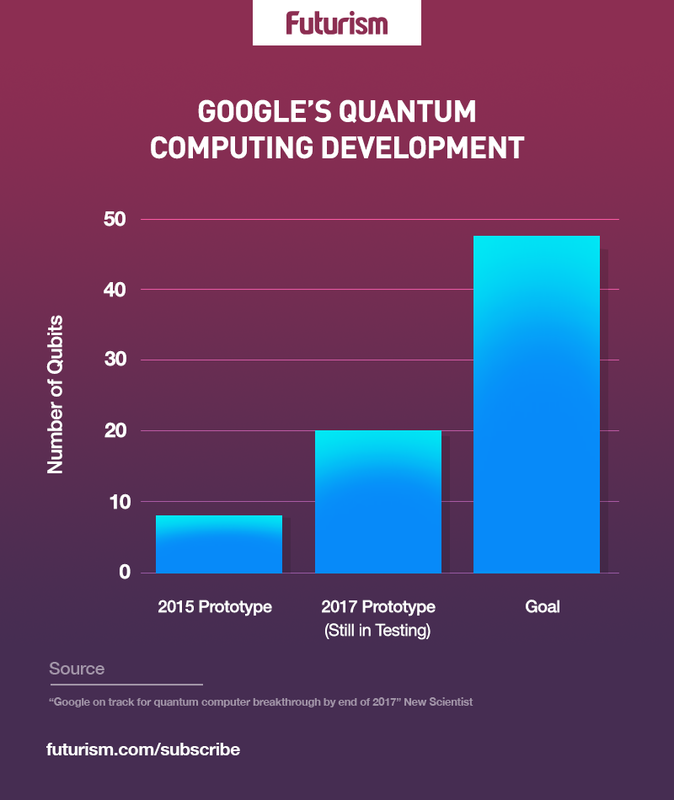 Google is maintaining its edge in the world of quantum computing. Its 20-qubit processor is currently undergoing tests, and the company appears to be on schedule to have its working 49-qubit chip ready by the end of 2017 as promised. Until it began trialing the 20-qubit chip, Google’s most powerful quantum chip was the 9-qubit effort from 2015. Traditional computer bits are binary, only existing as either 0 or 1; they’re like light switches that are either on or off. Qubits, on the other hand, can be 0 or 1 like regular bits, but can also have quantum properties that allow them to exist in a superposition where they are both 0 and 1 simultaneously. This makes qubits potentially far more powerful, because instead of figuring something out by trying each option one by one, they can simultaneously compute more than one possibility. Google’s 49-qubit chip will allow them to develop a 49-qubit quantum system that can solve problems that are far beyond the capacity of ordinary computers: Google calls this goal quantum supremacy. The 20-qubit system that the Google quantum computing team is now working on currently boasts a “two-qubit fidelity” of 99.5 percent. The higher the rating, the fewer errors the system makes. Quantum supremacy demands not only a 49-qubit system, but also sufficient accuracy to achieve a two-qubit fidelity of at least 99.7 percent—which Google is on track to deliver by the end of 2017. Google isn’t alone in their quest for advancing quantum computing. In 2016, IBM was running a 5 qubit computer, but by May 2017, it was offering beta access to its 16 qubit platform to the public for testing purposes. Furthermore, qubits alone aren’t the only consideration for actually achieving working quantum computers; error correction and scaling will also be critical to quantum systems. However, if Google does achieve quantum supremacy, it will be a major step forward.